An alert about an “active attacker” on the Carleton University campus was sent out in error Monday afternoon, a university spokesperson said. 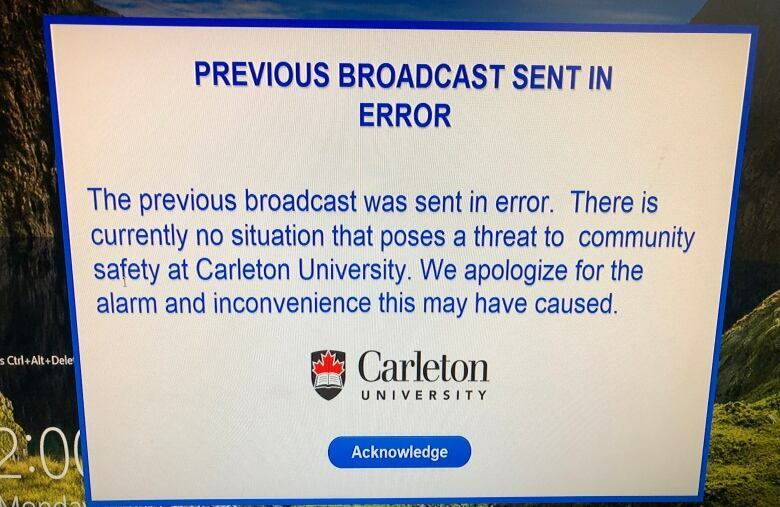 Carleton University has confirmed this message warning of an "active attacker" on campus was sent out in error Monday while emergency messaging systems were being tested. An alert about an "active attacker" on the Carleton University campus was sent out in error Monday afternoon, the school said, but not before giving some students a fright. The notification from the Carleton Department of University Safety went out to students, faculty and staff around 1:40 p.m. The alert was a false alarm that occurred "while emergency templates were being updated. A message was sent by mistake instead of saved," the school later confirmed in a statement. Someone hit "the wrong computer key" while updating emergency message templates, a spokesperson said. "The university profusely [apologizes] for the error and the resulting upset that was caused," the statement read. "We can reassure you that everything is safe and under control." The spokesperson said the school will look into strengthening its process for sending emergency messages to prevent a similar mistake. Carleton also warned some members of the university could continue receiving the erroneous message over the next few hours due to a bug in the alert system that causes delays. Administrators are also working to fix that problem, according to the spokesperson. A message notifying faculty and students of the error appeared on campus computers approximately 20 minutes after the first alert was sent. Some students first saw the alert when it popped up on their instructors' screens during lectures. Others realized something was wrong when fellow students working out at the campus gym suddenly stopped to peer at their phones. Some students told CBC News they locked classroom doors and waited quietly for the all clear. Others, suspecting a false alarm, reacted with a shrug and continued studying at tables in student lounges. "Things like that have happened before, and on way bigger scales," said Phoebe McDonald, pointing to a mistake last year when people in Hawaii were told a ballistic missile was headed their way. "This is sort of the risk of electronic systems, that sometimes there are glitches." Others were left shaken by the false alarm. "Just don't make a mistake like that, because there are thousands of students on campus," said Rebecca Sattaur. "I even texted my mom. Imagine the stress your parents are going through if you're telling them there's an attacker on campus."